The INDION Automatic DM Plant has been designed to provide Compact skid mounted system. The Indion swift plus features an additional cation exchange stage which is accommodated on the standard swift skid. As a result, the swift plus produces mixed bed quality water having a resistivity of always greater than 1 mg. ohm-cm for minimum capital outlay. It is exceptionally compact, and skid mounted on a corrosion resistant frame which also accommodates a stainless steel multipurpose pump. The water is passed through the demineralization plant for the removal of total dissolved salts. The DM consists of the strong acid Cations, weak base anion, and strong base anion. STRONG ACID CATION : Permanent hardness is removed by strong acid cation by exchanging the Cations in the water with H+ ions available in the resin and the water is decationised. STRONG BASE ANION : Then the water is passed through the strong base anion unit wherein the anions in the water are exchanged with OH- hydroxyl ions available on the resin. In strong base anion unit silica is removed. The water is thus demonized. The cation unit needs to regenerate with acid and the anion unit with the alkali. POLISHING UNIT(MB) : The DM water is passed through the Mixed bed for polishing and attaining the conductivity of 1 micro-Siemens/cm so that there is absolutely negligible dissolved solids in water. Air Blower is provided which is used after Regeneration. DEGASSER : Degasser can be incorporated to remove CO2 dissolved in water Thus reducing load on anionic bed & saving cost of caustic used for generation. 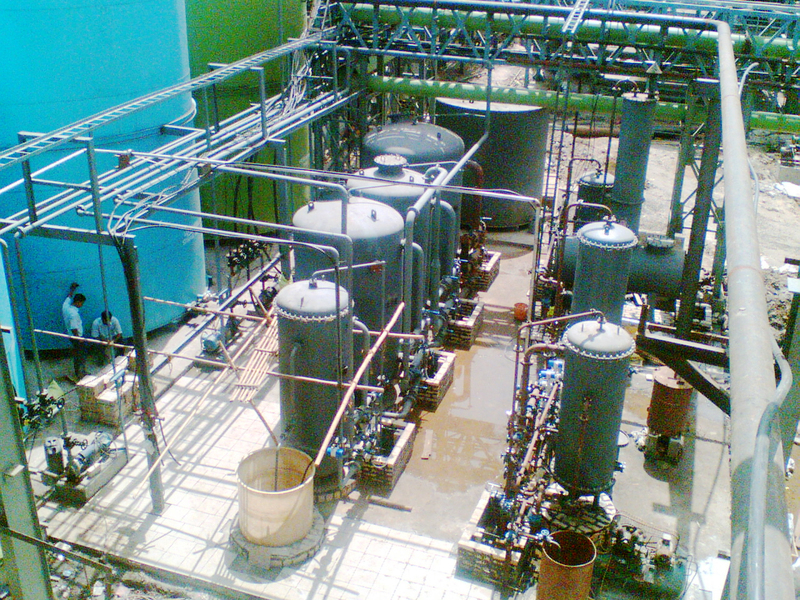 WBA/WAC would be recommended depending on Raw water analysis & after water parameter needed.